Porcuprints » Electrolytic rust removal for art and fun! Home » Electrolytic rust removal for art and fun! Electrolytic rust removal for art and fun! When Doug and I acquired our galley trays and metal furniture for setting type, they came with a bunch of rust on them. First we spent a long time scrubbing the trays and furniture with phosphoric acid (because the acid supposedly ate away at rust quickly), but it took a lot of elbow grease to get everything off. 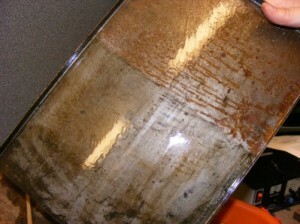 Doug was looking around for alternatives and discovered a process called Electrolytic Rust Removal. In the process, one uses electricity to transfer rust from one piece of metal to another. One piece of ferrous metal is placed in a tub of water and baking soda with the positive lead attached. The piece of metal you want rust removed from goes into the tub as well (being careful not to let the 2 pieces touch) and attach the negative lead. Turn on the power source and let it sit. Here is a video of Doug explaining the process with visuals.